Big Blue winners Alexey Molchanov & Jeanine Grasmeijer on a day off with Estrella Navarro, new Chilean record holder Sebastien Lira and American spearo Forrest Simon-Darias. Estrella Navarro should be proud; as an organizing force behind Baja Sur’s first international freediving competition, she can now take a relaxed breath of success. As can Big Blue chief of safety, Ren Chapman, and lead safety diver, Jonathan “Johnny Deep” Sunnex who both worked tirelessly (with many others) to ensure that all of the divers remained safe and operations ran smoothly. 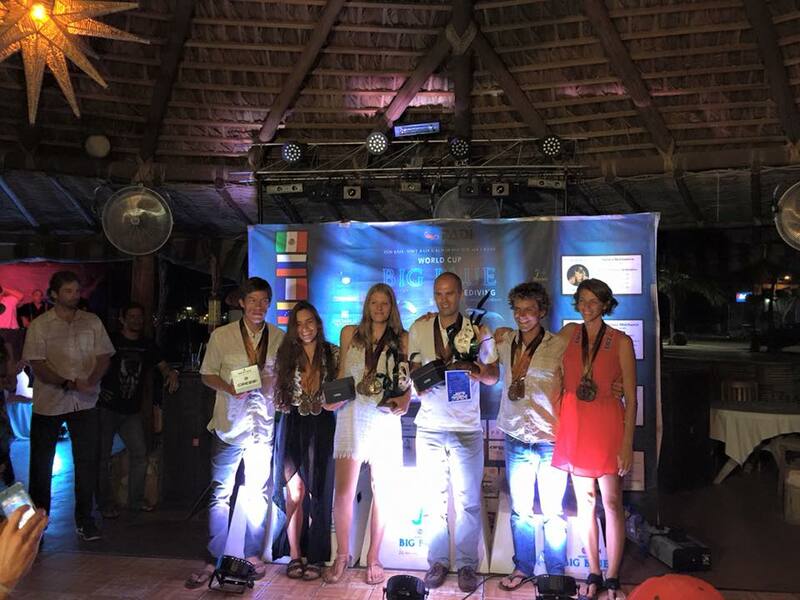 After five days of exceptional diving performances from all of the participants, the overall winners for the inaugural Big Blue are Alexey Molchanov of Russia for the men, and Dutch woman Jeanine Grasmeijer for the ladies. (Incidentally, both Alexey and Jeanine set world records in Kalamata, Greece in the fall of 2013.) Taking home silver medals are Sofia Gomez Uribe of Colombia, and Kurt Chambers for USA. And rounding out the platform in third place with their overall performances are Ashley Chapman of the United States, and Italian freediver Davide Carrera. 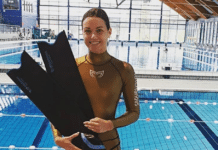 The first few days of the Big Blue freediving event were very promising with tremendous depths being posted by the freedivers, who were undeterred by environmental & logistical challenges. complimented Logan Mock-Bunting, a Hawaiian-based photographer who flew in to document the event. Given increasingly inclement conditions on the third day, the athletes and organizers opted to go to Balandra Beach instead (with Fun Baja) to enjoy a sunny, memorable day of leisurely fun in La Paz, Baja Sur, Mexico. Although she didn’t make the overall leaderboard, Tomoka Fukuda of Japan deserves special mention as she posted the deepest dive of the competition among all of the women, (and many of the men) taking home the gold medal in constant weight with her clean dive to 86m CWT. The Big Blue proved to be a rewarding experience for all of the competitors, ranging from reigning world champions to some newer athletes. Stay tuned to the Big Blue facebook page for a recap of total points and information on next year’s event. And watch a video of honored guest, event opener and World Champion Guillaume Nery talk about the Big Blue and freediving here below.